Black and white - YUMMY! I'm almost tempted to keep it for myself. 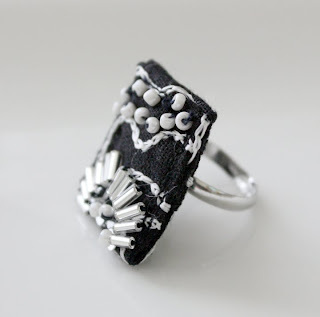 Black cotton with white embroidery, white seed beads and translucent white beads, and a few tiny silvery sequins on an adjustable ring. 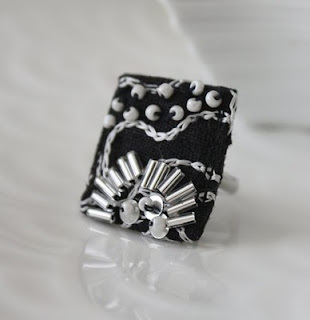 Choata choata jewelery, it's very cute. I wonder if we can make a magic wall dispenser for these. Ha ha - that would be nice - then I wouldn't feel guilty about neglecting my book illustrations!